This is a study of teachers' experiences in organizations. In particular, this study explores the experiences that prompted Black male teachers to consider a career in teaching, the organizational conditions that influenced their workplace experiences, and the organizational dynamics that affected these teachers' decisions to stay or leave their current schools or the profession. Drawing on interviews from 27 Black male teachers across fourteen schools in Boston Public Schools, this study found that an early experience teaching influenced participants' decisions to enter the teaching profession. Findings from this study also suggest that the number of Black men on a school's faculty influenced participants' workplace experiences. Participants who were the only Black men on the faculty, or whom I describe as "Loners," faced greater challenges in navigating the organization when compared to participants in schools with many more Black male teachers, or "Groupers." Moreover, there was a relationship between the reasons participants cited for leaving, participants' actual decisions to stay or leave, and organizational characteristics. Loners stayed. Groupers moved to other schools and some left teaching altogether. Loners cited the school's overall working conditions as their reason for staying, while Groupers described administrative leadership as their reason for leaving. 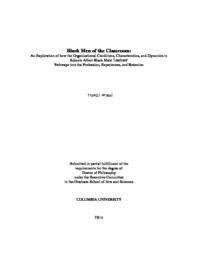 This dissertation builds on the nascent literature that explores how organizational conditions, characteristics, and dynamics in schools affect the pathways into the profession, experiences, and retention of Black male teachers.